Hindustan Times is an Indian English-language daily newspaper founded in 1924 with roots in the Indian independence movement of the period ("Hindustan" being a historical name for India). The newspaper is owned by Rajya Sabha M.P. Shobhana Bhartia. It is the flagship publication of HT Media. Hindustan Times is one of the largest newspapers in India, by circulation. According to the Audit Bureau of Circulations, it has a circulation of 1.16 million copies as of November 2015. The Indian Readership Survey 2014 revealed that HT is the second most widely read English newspaper in India after The Times of India. It is popular in North India, with simultaneous editions from New Delhi, Mumbai, Kolkata, Lucknow, Patna, Ranchi, Bhopal, and Chandigarh. The print location of Jaipur was discontinued from June 2006 and that of Nagpur edition was discontinued from September 1997. HT launched a youth daily, HT Next, in 2004. 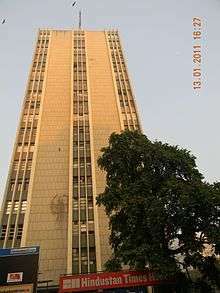 The Mumbai edition was launched on 14 July 2005 and the Kolkata edition was launched in early 2000. In the The Brand Trust Report 2012, Hindustan Times was ranked 291st among India's most trusted brands and subsequently, according to the Brand Trust Report 2013, Hindustan Times was ranked 434th among India's most trusted brands. In 2014 however, Hindustan Times was ranked 360th among India's most trusted brands according to the Brand Trust Report 2014, a study conducted by Trust Research Advisory, a brand analytics company. Other sister publications of Hindustan Times are Mint (English business daily), Hindustan (Hindi Daily), Nandan (monthly children's magazine) and Kadambani (monthly literary magazine). The media group owns a radio channel, Fever 104.0 FM, and organises an annual Luxury Conference which has featured speakers like designer Diane von Fürstenberg, shoemaker Christian Louboutin, Gucci CEO Robert Polet and Cartier MD Patrick Normand. Hindustan Times is owned by the KK Birla branch of the Birla family. K. M. Panikkar was its first editor; Devdas Gandhi (son of Mahatma Gandhi) on the editor's panel, and later editor. The opening ceremony was performed by Mahatma Gandhi on 26 September 1924. The first issue was published from Naya Bazar, Delhi (now Swami Sharda Nand Marg). It contained writings and articles from C. F. Andrews, St. Nihal Singh, Maulana Mohammad Ali, Cattamanchi Ramalinga Reddy, T. L. Vaswani, Ruchi Ram Sahni, Bernard Haton, Harinder Nath Chattopadhyaya, Dr Saifuddin Kichlu and Rubi Waston etc. K. M. Panikkar also known as Sadar Panikkar launched the Hindustan Times as a serious nationalist newspaper. As an Oxonian, historian, and litterateur, Panikkar must have hoped to make his paper eventually more than an Akali sheet. He became the editor and funds flowed freely from activist Akali patrons. He exerted himself strenuously, but the paper made very little headway. In two years Panikkar could not take the print order any higher than 3,000. By then the Akali movement appeared to lose steam and funds dried up. The paper was saved from an untimely demise when Pandit Madan Mohan Malaviya stepped in to realise his vision of a newspaper in Delhi. It has its roots in the Indian independence movement of the first half of the twentieth century and even faced the noted "Hindustan Times Contempt Case (August–November, 1941)" at Allahabad High Court. It was edited at times by many important people in India, including Devdas Gandhi, Sri Mulgaonkar, B.G.Verghese and Khushwant Singh. Sanjoy Narayan was editor in chief of the paper from August 2008 till July 2016. Recently the editorial page has seen a major makeover and has been named "comment" to bring in more flexibility and somewhat less seriousness to the page. The Delhi-based English daily Hindustan Times is part of the KK Birla group and managed by Shobhana Bhartia, Rajya Sabha member of Congress party and daughter of the industrialist Krishna Kumar Birla and granddaughter of Ghanshyam Das Birla. HT Media is a subsidiary company of Hindustan Times. The KK Birla group owns a 69 percent stake in HT Media, currently valued at ₹834 crore. When Shobhana Bhartia joined Hindustan Times in 1986, she was the first woman chief executive of a national newspaper. Shobhana has been nominated as a Rajya Sabha MP from Congress Party. Along with Hindustan Times, HT Media owns Desimartini, Fever 104 FM, and Mint newspaper. 1 2 "Submission of circulation figures for the audit period July - December 2015" (PDF). Audit Bureau of Circulations. Retrieved 5 January 2016. ↑ Limited-AboutUs "About Us" Check |url= value (help). Htmedia.in. Retrieved 2015-05-29. ↑ "This Is Not Journalism as We Know It". Openmagazine.com. Retrieved 2015-05-29. ↑ Hazarika, Sanjoy (1995-03-05). "Indian Leader Faces a Test At the Polls". India; Maharashtra State (India); Gujarat (India): NYTimes.com. Retrieved 2015-05-29. ↑ "Indian Readership Survey (IRS) 2014" (PDF). Newswatch.in. 30 June 2010. Retrieved 16 October 2007. ↑ "India's Most Trusted Brands 2014". Trustadvisory.info. Archived from the original on 2 May 2015. Retrieved 2015-05-29. ↑ "HindustanTimes". Urduyouthforum.org. Retrieved 2016-04-11. ↑ "Shobhana Bhartia wants to benchmark HT with the best in the world". Business Today. 14 October 2012. Retrieved 18 March 2014. ↑ George, T. J. S. (2007). Lessons In Journalism. Viva Books Private Limited. ISBN 978-81-309-0788-8. ↑ Hindustan Times Contempt Case (August–November, 1941). READ BOOKS. 2007. p. 283. ISBN 1-4067-6748-4. ↑ "Indian Advertising Media & Marketing News – Exchange4media". Exchange4media.com. Retrieved 2015-05-29.